“Wreck-It Ralph” was one of my favorite movies of 2012. The look inside the lives of video game characters should have won the Oscar for Best Animated Feature that year instead of “Brave.” Six years later, we’re getting a sequel that finds the oafish, well-meaning villain (John C. Reilly) going on another adventure with spunky, childish racer Vanellope (Sarah Silverman). Maybe it’s because I’ve put the original on such a high pedestal, but I don’t think the follow-up quite measures up. Ralph has what he thinks is the perfect life, doing the same perfect things every day. But Vanellope wants a break from the sameness, even if it means risking imperfection. Ralph tries to cheer her up by building a new track for her “Sugar Rush” game, but he’s always been better at wrecking things than fixing them, and soon “Sugar Rush” is broken and in danger of being permanently scrapped. Ralph and Vanellope believe that the answer may lie in the arcade’s newest feature – a WiFi connection. They journey to the unknown world of The Internet in search of answers. The good news is that they find the part to fix “Sugar Rush” pretty quickly. They even win a bidding war on Ebay, so the part can be shipped to the arcade as soon as it’s paid off. Small problem: Ralph and Vanellope have no money and no idea of how to make it. They try to steal a valuable car from a violent online game called “Slaughter Race” with no luck, but the game’s main character Shank (Gal Gadot) gives them the idea to make funny videos to earn money. Ralph teams up with the head of a video site (Taraji P. Henson) for a series of humiliating videos that become a sensation. He’s eager to return to the arcade with Vanellope, but she actually prefers “Slaughter Race” to “Sugar Rush.” In Ralph’s mind, this threatens the friendship, but is it really such a threat if it offers Vanellope a better life? There’s a good message in this movie about how friends can go down different paths and still be friends. In the real world this can apply to friends who move away, take on new interests, or even make new friends. It’s not as strong as the “what you think is a weakness might actually be your strength” message of the first film, but it’s perfectly practical. It’s in other areas that the film irks me. 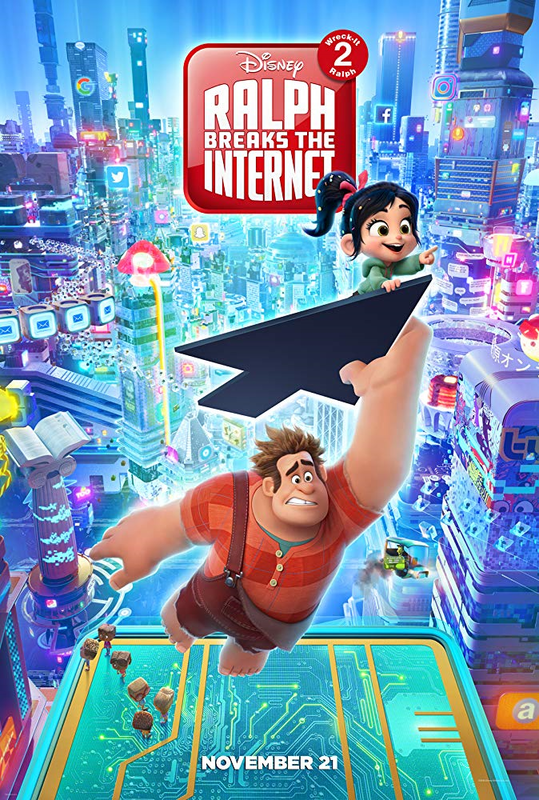 My main complaint is that the film can’t decide what the rules are for Ralph and Vanellope when it comes to the internet and how they can affect change in the real world. It just seems like a betrayal of “Wreck-It Ralph” lore that Ralph can enter a real bid for a real item, pay for it in real money, and have it really shipped to the arcade. It’s the same problem I had with “Inside Out” and “Frozen” where the filmmakers just seem to be making up this world as they go along and solutions to predicaments can be pulled out of thin air instead of earned. Speaking of “Frozen,” there’s a much-anticipated scene where Vanellope meets up with Anna, Elsa, other princesses, and the rest of the Disney empire. I’m sorry to say I was disappointed. The film seems so impressed with the mere act of getting these iconic characters onscreen together that it forgets to have them do anything funny or meaningful other than make tired jokes about Disney tropes. They do serve a purpose later in the movie, but it’s too little too late. Ah, but “Ralph Breaks the Internet” is never anything worse than harmless fun. Like just about every Disney animated feature, it’s often creative and enjoyable and aspires to be so much more than cinematic junk food. Grumpy me is coming in and saying it needs more rules, but if you and your family just want to appreciate the film for what it does right, that’s perfectly fine. “Ralph Breaks the Internet” is rated PG for some rude humor and action/violence. Its running time is 101 minutes.